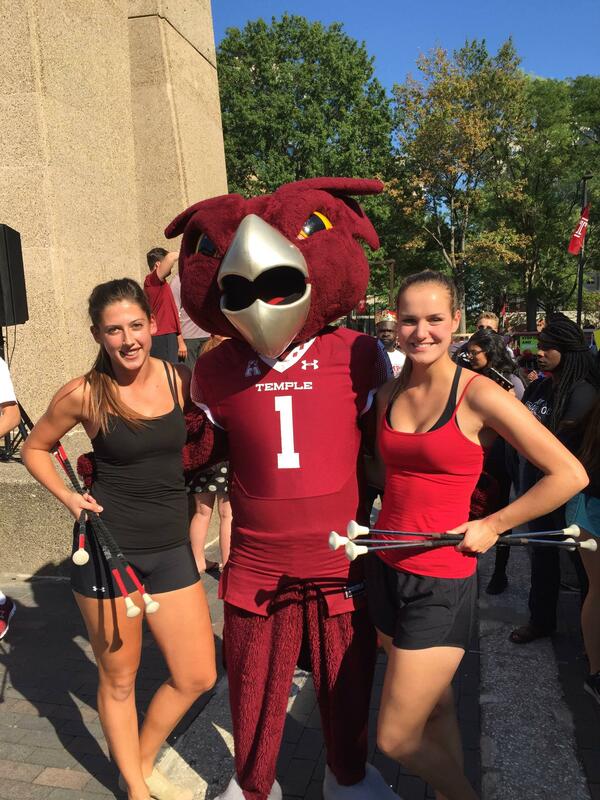 Happy Twirler Tuesday! 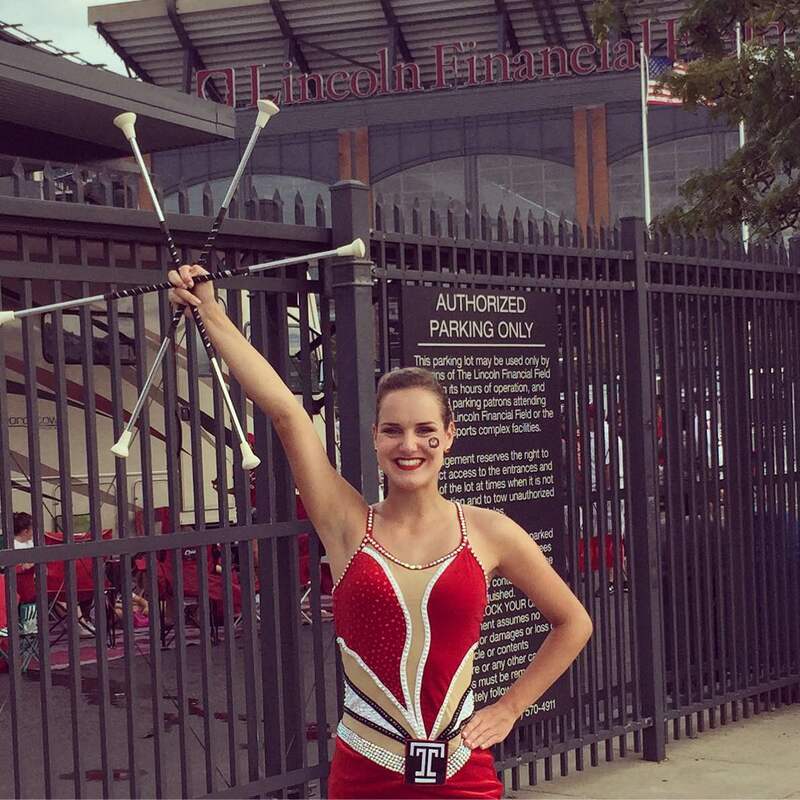 We're happy to introduce you to Bailee Russell, one of the Diamond Girl Feature Twirlers, from Temple University! This is Bailee's first season and she has experienced everything from twirling competitions with the football team to busting a move with the band... safe to say, she's having the time of her life. Check out some of the clips below and read our interview with her. 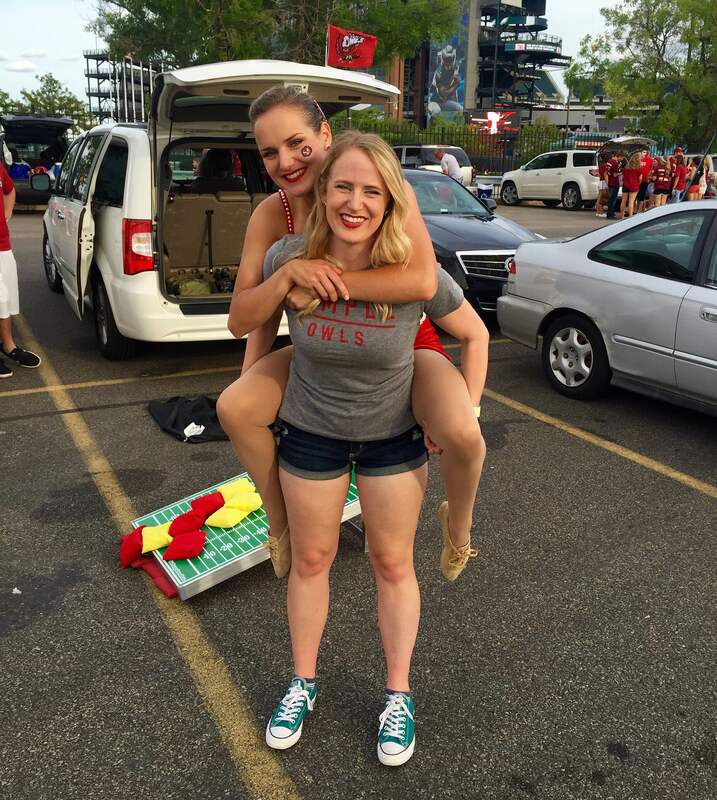 As always, if you're interested in being featured for Twirler Tuesday email us - cmbtwirl@sullivation.com! BR: My name is Bailee Russell and I’m from Buffalo, NY. 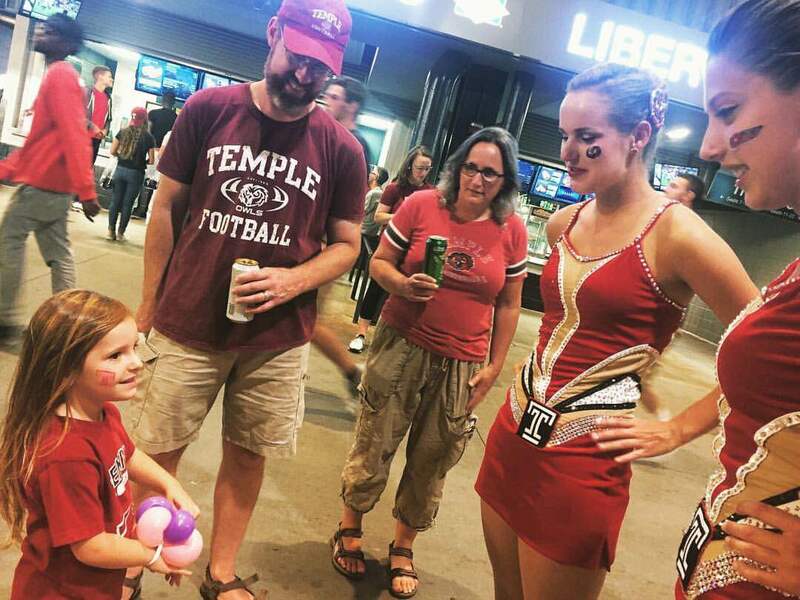 I attend Temple University in Philadelphia, Pennsylvania and am one of the Diamond Girl Feature Twirlers for the Temple University Diamond Marching Band, directed by Dr. Matt Brunner. Following in the footsteps of my mom and coach, Kelli Russell, and my sister, Chelsea Russell, I began competitive twirling in the National Baton Twirling Association when I was nine years old. CMB: What's your favorite memory being a part of your college marching band? BR: My favorite memory happened at my first game this fall. Pregame was starting in just a couple of minutes and I felt so nervous I could barely breathe. Just minutes before the band goes out for pregame, when the football team runs through the tunnel to prepare for the game, the band plays “My Songs Know What You Did In The Dark (Light Em Up)” by Fall Out Boy every game. When I first experienced this, I was standing right in the middle of the band in the tunnel, and the song was so loud I could barely hear myself think. As the football team ran by, high-fiving the band, I felt so much excitement rush through me and I completely forgot about my nerves. Nothing pumps me up for pregame more than this and I will never forget how excited this moment made me feel! CMB: Finish this sentence... "One time at band camp..."
BR: One time at band camp, the band surprised the football team during their practice. The band played a few songs and following our performance, the football coach, Matt Rhule, asked me my name and asked if I would toss my baton to the wide receiver. Coach Rhule said if he caught my baton, the team wouldn’t have to run after practice (if he caught it in one hand, of course). Brodrick Yancy caught my baton and the video of the encounter went viral. This was so exciting, especially being my first band camp, and from that moment on, I couldn’t wait for more exciting opportunities like this as the Diamond Girl! BR: In the summer of 2015, my team, Crescendo, had the opportunity to attend the inaugural Grand Prix Competition in British Colombia, Canada. This was an International event and it was my first world-level competition. This was a big deal for me because many of my competitors began twirling as young as three years old and I always felt that my late start to competitive twirling would set me back. With a ton of hard work and determination, my teammates and I worked to create the best routine we could; we ended up receiving fourth place, being in third place, right behind the two Japanese Teams, as we went into finals. I am so proud of what Crescendo has accomplished, especially for being a brand new team at the time and only being around for a few years, and I will never forget what if felt like in that arena at an International competition among some of the best baton twirlers in the world. BR: I advise these twirlers to do their best to stay calm during the application/audition process. It is stressful to say the least, especially for us twirlers, considering the fact that auditions are usually in late March or April, right before decision day. I remember feeling like all my friends knew where they were going and I felt like I would never know! As cliché as it sounds, you will end up where you’re supposed to be. I never imagined ending up at Temple; I thought it would be too expensive and would just never work out in my favor. That being said, I couldn’t imagine myself anywhere else! Temple University has become my home and the TUDMB truly is my family. You will end up where you’re supposed to and you will LOVE it! BR: Before pregame, I always focus on what’s going on around me and my excitement to distract me from my nerves. As the band gathers in the tunnel while the drumline enters the field to begin pregame, various band members are yelling chants to each other trying to build up the excitement and hype everyone up. The anticipation that goes on in that tunnel before we all run out onto the field is unreal and I look forward to it every home game! BR: Oreos! If you ask anyone who knows me well, they know that I can eat half a package of Oreos in one sitting, which is slightly embarrassing, but I truly can’t go a week without my Oreos! BR: Make friends with the band members! My twirling partner, Inga, is a senior and will be leaving me next year, and I will be the only Diamond Girl. While this may be lonely at times and a little weird since I won’t have my own “section”, I’m so lucky to have met so many new people through the TUDMB that I am happy to call my best friends! BR: My sister, Chelsea Russell, has been my role model for as long as I can remember. She is eight years older than me, which meant for many years, we barely knew each other since she was away at school at the University of Iowa as the Golden Girl, while I was growing up. One summer, Chelsea broke her foot right before NBTA Nationals and was unable to compete. We spent so much time together that summer and she has been my best friend ever since. She handled her misfortune with so much grace and dignity and supported me and our teammates at Nationals. She also worked so hard to overcome her injury and finished her last season as Golden Girl stronger than ever. Chelsea is not only my idol as a baton twirler, but she is as a person as well and I always admire her strength and ambition! 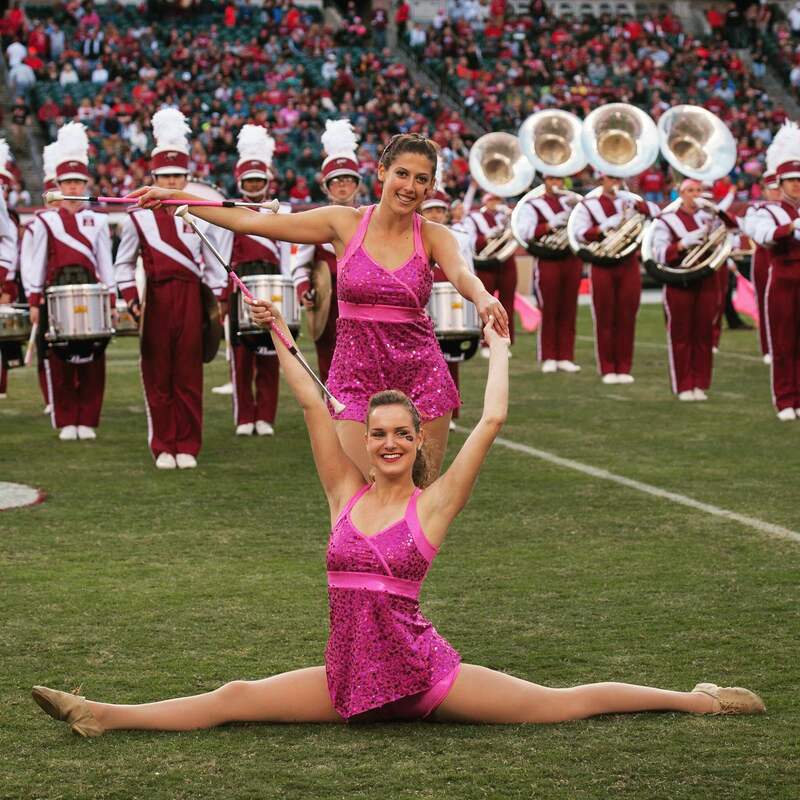 BR: Since I am only a freshman, I plan to continue as the Diamond Girl for the TUDMB and enjoy my last three years. I look forward to this journey and can’t wait for the experiences that are to come. We had a blast in Annapolis for the American Athletic Conference Championship game and I am so glad the band got to be there! I am also incredibly excited to go to my first bowl game, the Military Bowl in Annapolis, Maryland when Temple plays Wake Forest. I plan to begin competing in the collegiate divisions in NBTA including College Miss Majorette of America and the Collegiate National Twirling Championships. Currently, I am studying Actuarial Science at the Fox School of Business at Temple. I plan to continue my studies at the business school and pursue an occupation in math and business. CMB: Bonus question - anything else that the fans of CollegeMarching and CollegeTwirling should know? BR: The Temple Band is such a great, fun environment. I love how we always play modern, popular music so the crowd knows the music and is always able to sing along! 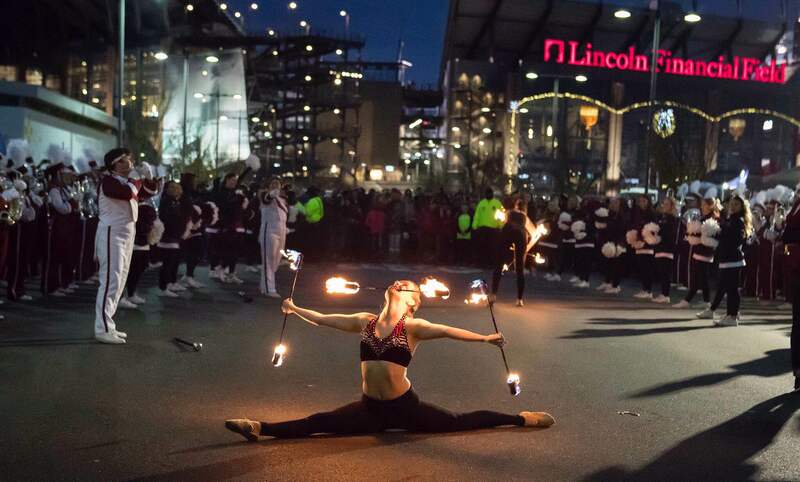 The Temple Marching Band has taken part in Hollywood movies and events in New York City and Philadelphia including the Oscar nominated film the Wolf of Wall Street, the remake of the movie Annie, and recently filmed an episode of the popular television show Madame Secretary. I think the coolest thing about my band is that every game, every member sets their instruments down and dances during a drum break. The crowd loves it and I couldn’t imagine a more exciting place to spend my Saturdays! Go Owls!